That’s what happened on the first and last day of summer camp. Everybody was crying. Campers. Counselors. Parents. Big, uncontrollable tears sliding down our faces. 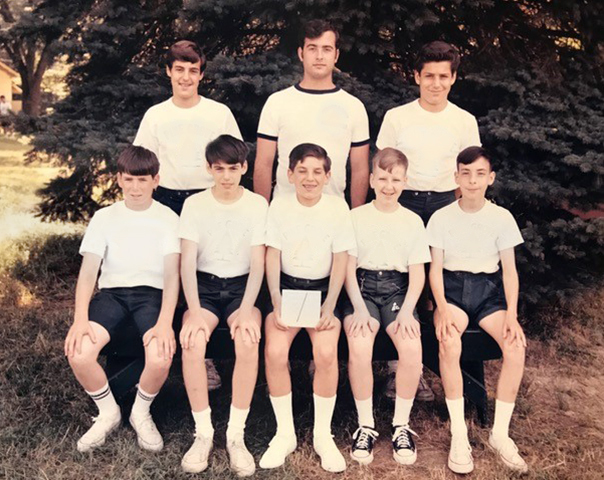 I went to sleepaway camp from 1963-1968. Eight weeks each summer. No TV for eight weeks! How did we survive? I know how. We spent the whole day outdoors. We played softball, ping-pong, basketball, and tetherball. (Remember tetherball? That was a weird sport.) We went swimming and fishing in the lake. I learned how to handle a canoe and a rowboat. We had archery and arts and crafts, which we, of course, called arts and farts. (Remember making lanyards? What was the point of that?) I even tried boxing once. (Not a good idea.) One day I ran into a tree chasing a Frisbee and was knocked unconscious. The memories come flooding back. Overnights in the woods. Learning how to build a fire. Toasting marshmallows. Some counselor would pull out a guitar. It was the mid sixties, the heat of Beatlemania. I remember whispering to my bunkmates in the dark after “lights out.” One night, our counselors woke us up in the middle of the night with a pizza. I hated pizza back then. Every time my family went out for pizza, I sat in the car because I couldn’t stand the smell. But at camp, pizza was our reward for good behavior. So I came to love it. “Visiting Day” was around the four week mark. Our parents would show up with boxes of candy and junk food. That night, we would spread a blanket on the floor of our bunk and stuff our faces with popcorn and KitKats. (As if we didn’t get enough treats, right? Remember the “canteen”? At my camp, the boys and girls were strictly segregated. The girls’ camp was like some mysterious foreign land, on the other side of the lake. Once a week there was a “social,” where we could interact with actual living females. Eeek! Scary! I remember dancing awkwardly to “Jumping Jack Flash” with a girl. I got my first kiss that night, out behind the rec hall. We felt like we were in the middle of nowhere at camp, a million miles from our parents. But I just Google-mapped it. My camp was 36 miles from the house I grew up in. On the last day of camp, the waterworks were the strongest. In general, I’m not a crier. But it was so hard to say goodbye to my bunkmates and counselors. Some of them would become lifelong friends. Some I would never see again. And then, of course, the waterworks came. There’s something about summer camp that does that to you. I feel the waterworks coming on right now, just thinking about it. Dan Gutman is the author of the My Weird School series, The Genius Files, Flashback Four, The Kid Who Ran For President, The Homework Machine, The Million Dollar Shot, and many other books for young readers. You can find out more about Dan and his books at www.dangutman.com or follow him on Facebook, Twitter, and Instagram.